My poor neglected little blog! I caught the flu after my last entry and it really hit me hard. I had a flu shot in the fall but it didn't do anything to prevent this one. I'm slowly getting back to my old self but have a ton of things to catch up on. I hope if you are reading this that you're healthy and well! At least the garden is still blooming. 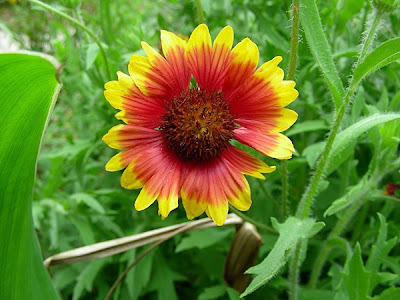 These are Gaillardias I grew from seed. It took them a few years to get going but now they are bursting with blooms! I am feeling so much better now, nothing like a really bad bout of illness to help you appreciate just the everyday things! I love perennials (so easy! ), and these Gaillardias just get better every year so far! :) I tried growing California Poppies but they didn't last very long.